My parents’ 60th wedding anniversary was coming up, and my sister suggested that I re-create our mother’s wedding bouquet for the centerpiece of the celebratory dinner we had planned for them. What a great idea, I thought, and set about planning. I enjoy making casual bouquets with flowers that I grow and gather from the wild, so I figured it wouldn’t be too difficult to put together a nice arrangement from preordered blossoms. For reference, I found a Kodachrome snaphot of Mom with her wedding flowers. Through the orange cast the photo had taken on over the years, I could see the shape of the bouquet and the roses but not much else. Though it would blow the element of surprise, I would have to rely on my mother’s memory to learn about the other flowers. 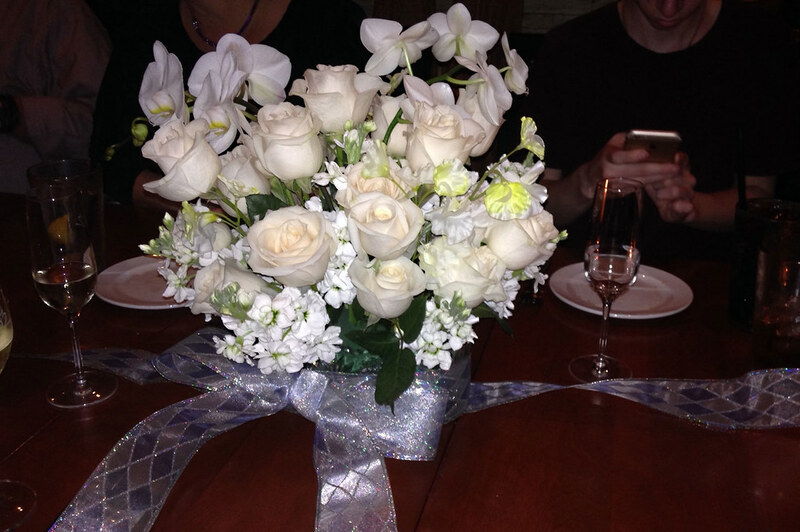 She reported that she had ivory roses, white sweet peas, and a single white Cattleya orchid. About three weeks before the party, I called the one wholesale flower market in Birmingham, Alabama, where my parents live. Cream-colored roses I could get with no problem, so I reserved two dozen. Sweet pea blossoms were next on my list. For these the florist said he’d have to call his suppliers. I also asked him to find me a big Cattleya, which was to be the central focus of the bouquet. When I checked back a week later, the florist reported that white sweet peas were simply not to be had in late December, at least not in Birmingham. Even though it would mean transporting the fragile flowers nearly a thousand miles by car from Manhattan, I started calling local suppliers in New York City’s renowned flower district. To my surprise, none of the sellers I checked with could offer anything but stems of silk sweet peas this time of year. I then tried a San Diego company’s website that listed fresh sweet peas in its catalog, but none were currently available. According to the manager, even if she had them, the current spate of frigid weather precluded shipment of any tender blossoms across the country. “They would be translucent mush by the time they got there,” was how she put it. Finally, I contacted a farm-direct wholesaler in Florida that sources fresh flowers from South America, Costa Rica, the Netherlands, New Zealand, China, and Thailand, as well as the U.S. This company could get some to me, but I would need to buy them in bulk, starting at $170. Not an option. I would have to go with silk imposters. Even more distressing was that no one could get me a white Cattleya orchid. The Birmingham florist said that the market for them had dwindled over time, and his supplier had left the business. A few calls to New York florists were also fruitless. As recently as the early 1980s, cattleyas were widely available to florists, but no more. According to the February 1956 American Orchid Society Bulletin, “Of all the varied kinds of orchids grown throughout the world, there is none which surpasses the Cattleya in popularity.” At the height of their demand, in the 1940s, ’50s, and ’60s, they were seen as corsages on the shoulders and wrists of movie stars, Mother’s Day moms, and prom dates across the country. First Lady Mamie Eisenhower was rarely seen in public without one. The plant itself is somewhat difficult to grow and often blooms only once a year, so the blossoms were expensive and precious, despite their apparent ubiquity. My mother recounted that after her wedding, she refused to toss the bouquet because she couldn’t bear to give up her orchid. Future First Lady Mamie Eisenhower, wearing a Cattleya orchid corsage in 1952. Photo courtesy of the Richmond Times-Dispatch. As both social customs and clothing became more casual and free flowing toward the late 1960s, corsages of this ostentatious flower fell out of fashion. Though still popular among hobbyists and specialists, cattleyas have been replaced in recent years as the favorite orchid of the floral industry primarily by moth orchid (Phalaenopsis) hybrids, which are less finicky to grow, bloom more often, and have long-lasting stems of multiple flowers. Advances in propagation methods and shipping have resulted in a flood of phals and other small-flowered orchids on the market, and plants can now be purchased for as little as $5 at grocers and home-improvement chains like Lowe’s. Everyone I spoke to counseled me to buy a potted moth orchid from a big-box store and use its blooms for my arrangement. As much fun as I was having with my floral detective work, I was running out of time to source flowers, so another compromise would have to be made. How was it that a small florist in Hannibal, Missouri, could source sweet peas, white roses, and Cattleya orchids in the dead of winter in 1957? I queried my mother once again, and she suggested that the sweet peas, at least, had been grown locally. My aunt, who still lives near Hannibal, recalled asking for them in recent years and learning that the florist had stopped growing them because they were so labor intensive. Joe Schmitt, a Wisconsin-based grower I spoke with, recalled the days when sweet peas were widely grown for the cut-flower industry and confirmed how much work was required to grow them. “The vines grew on trellises 10 to 12 feet high, and cutting was done from rolling ladders similar to those in old libraries.” They also needed constant pinching back and deadheading to encourage flowering on the delicate stems. The longtime popularity of sweet peas, however, made it worth the effort, at least until around the 1970s, when cheaper air freight and other market forces made it cost-effective to ship fresh flowers long distances. Countries like the Netherlands and Ecuador were able to outcompete local growers, both in price and variety of flowers, making mom-and-pop greenhouses—and their sweet peas—mostly a thing of the past. Mom also mentioned that of all the flowers in her bouquet, the roses were actually the hardest to get. One of the suppliers I called, Karl Auwaerter, of Bayport Flower Houses in Long Island, explained why this was likely true. In the 1950s, most roses on the American market were still grown by small domestic operators. Maintaining individual plants was expensive and laborious, and trying to anticipate which colors and varieties would be popular was financially risky. Roses are also notoriously susceptible to cold, so Mom was lucky to get those cream-colored long-stems for her January wedding. Early on the morning of the dinner party, my sister and I drove downtown to the wholesale flower market to pick up the roses. The moth orchid plant I’d bought earlier from the Home Depot had two stems of blossoms, but I got one more blooming pot here for good measure. I also bought a bunch of fragrant white stock for filler if I needed it. Once we got home, I trimmed all of the cut flowers and put them in buckets of tepid water to sit for a couple of hours while we did other errands. To hold the arrangement, I had just the thing: a vintage pressed-glass compote on a six-inch stem, roughly the shape of a wedding nosegay. Since 60 years is considered the diamond anniversary, the diamond-cut pattern of the glass seemed perfect. I’d carefully packed it in bubble wrap for the road trip south, along with some silver-and-ice-blue diamond-patterned ribbon, green florist’s wire and tape, and a chunk of floral foam cut to fit the bowl of my little vase. My sister had also pulled out an oblong saw-tooth crystal bowl as a fallback. When it was time to do the arrangement, I fixed the presoaked floral foam in the compote with a grid of clear tape and started putting in the roses. Almost immediately, the foam base started listing, first one way and then the other, and no amount of symmetrical flower placement could keep it balanced. I imagined the whole thing toppling over in a sad heap at the table, exposing me as the rank amateur I am. I would have to use the un-nosegay-like but utterly stable bowl. I used all the roses I had and nearly all the stock to fill out the arrangement, adding the silk sweet peas and orchid stems last. I wrapped some ribbon around the base of the bowl and used a bit more to decorate the table beneath it once we got to the restaurant. My parents’ anniversary arrangement wasn’t exactly a replica of Mom’s wedding bouquet, but it made a fine centerpiece for the table, and putting it together was a fascinating foray into cut-flower trends and the mutability of the floral industry. Besides, it’s the thought that counts—and nobody noticed that the sweet peas were fake! Lovely arrangement and fun story. My pink carnation flower girl bouquet would be easier to replicate. I still remember it and how wonderful it smelled. 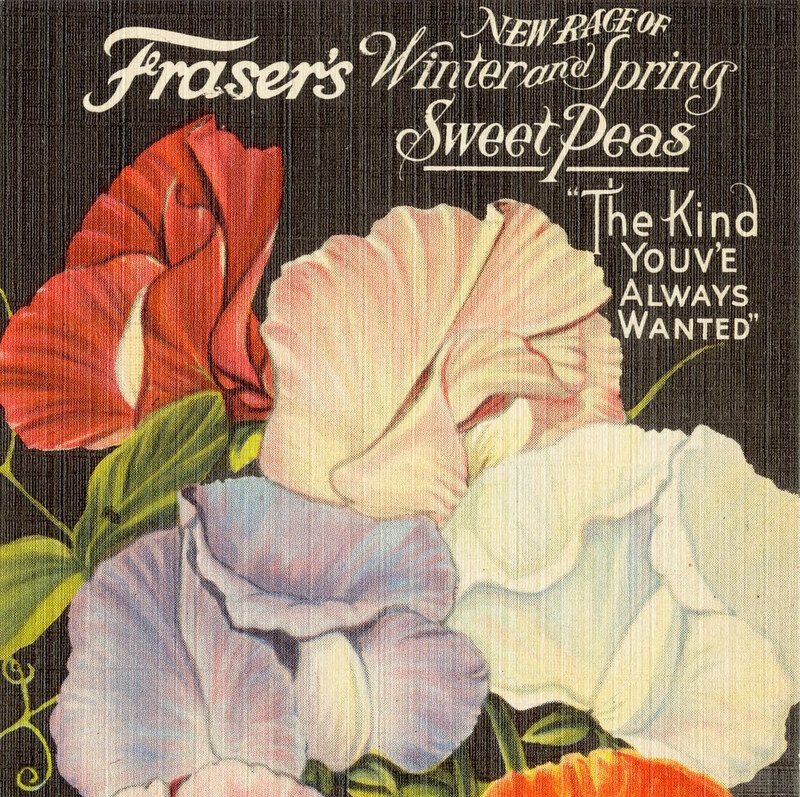 Sweet peas were once extremely popular in the cut-flower industry. Print by the Tichnor Brothers. The anniversary centerpiece, made up of two dozen ivory roses, two stems of moth orchid blossoms, silk sweet peas, and white stock. Photo by Joni Blackburn. 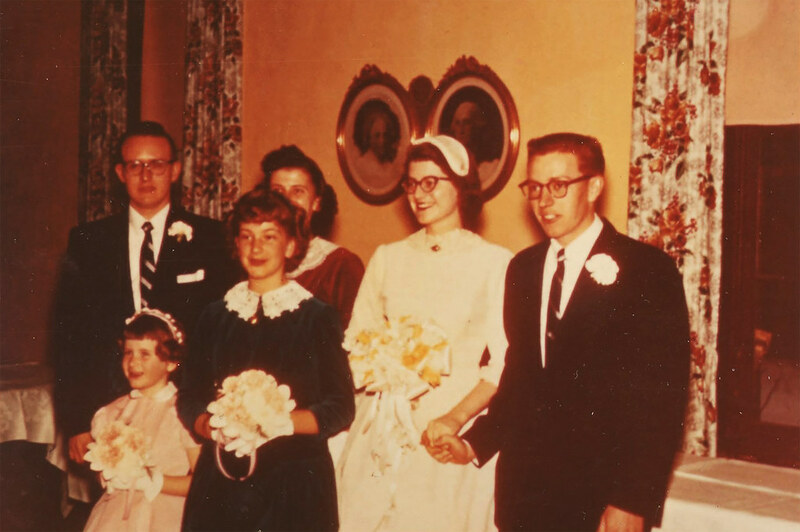 The author's parents on their wedding day in January 1957. Photo courtesy of Joni Blackburn.